Roll-A-SignTM , a division of Reef Industries, is a disposable, plastic banner, ideal to promote your company or special event. Manufactured of premium-quality, weather-resistant 6-mil polyethylene film, Roll-A-SignTM is available in widths ranging from 18 to 36 inches with four-spot colors. Roll-A-Sign's high-strength material provides superior tear resistance with an exceptional ability to withstand extended exposure to weather conditions. Perforated signs and biodegradable material options coming soon. Aquatic Technology Inc. is a superior choice for aquatic and recreational safety signs because of their professional quality, durability and variety. Designed to meet national and state pool codes for all 50 states and color-coded to meet national safety standards, Aquatic Technology has an up-to-date pool/spa regulations database. The signs are made with heavy-duty white styrene (plastic) or aluminum. Weather-resistant, the signs are printed using bright UV-resistant inks and are also pre-drilled for easy hanging. Reduce your liability by ensuring the safety of your guests and swimmers. Choose from over 500 in-stock signs, as well as quality custom signs, flags and banners. Today, yurt building is a growing, robust industry, and Pacific Yurts is celebrating its 30th anniversary. Found throughout the United States and on every continent, Pacific Yurts are an ideal solution for those who want to provide access and accommodations in natural scenic areas while assuring guests and conservationists of minimal environmental impact. Pacific Yurts' innovations and reputation for sustainable business practices have attracted national and international recognition and numerous awards. The production, marketing and service philosophies of the company reflect a passion for quality, the outdoors and the belief that cross-cultural exchanges are essential for global understanding, respect and harmony. Newstripe announced the newly designed All-Pro 3, with more traction, better handling and a lower price than the All-Pro II. It is 35 pounds lighter and 5 inches shorter, providing the perfect combination of stability and control. 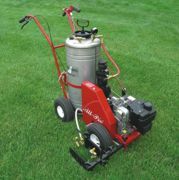 Priced at $2,995, it is the best value for a self-propelled, pressurized-tank, field-marking machine. With the All-Pro 3, you can effortlessly line a field as fast as you can walk. Its 12-gallon tank means fewer stops to refill. Bi-directional spray head paints fields twice as fast, coating the front and back of the grass blades at the same time. Shut one nozzle off for practice fields, and save money. Protect your property with fire-rated receptacles. Landscape BrandsTM introduced 30-gallon receptacles that meet UL 1315 classification requirements. The GE30-FR series is made of 0.5-inch thick stone aggregate molded to 20-gauge steel. These heavy-duty receptacles are designed to contain trash fires, keeping heat and flames from spreading to surrounding areas. Receptacles are available in your choice of five stone colors with ashtray, bonnet or curved style metal tops. Units ship fully assembled with a steel liner. Hold-down kits are also available. Bradley column showers can be configured to fit any application—from two to six user stations. Options offered include standard and juvenile heights, a choice of balancing, mixing or metering valves, as well as different shower heads and volume-control options. Barrier-free models also available. All are stainless steel and shipped preassembled. Vyn-All Pool Products has expanded its safety cover offering for commercial aquatic facilities and now offers seven different fabrics for its line of custom safety covers. Vyn-All now offers solid covers in blue and green plus standard mesh covers in blue, green and black fabrics. Additionally, they offer a commercial-grade black mesh with a 20-year warranty. Vyn-All is also offering its new Sun-Guard MeshTM –a new material that provides 99 percent shade (U.S. Patent No. 6,886,187), which severely retards algae growth while the pool is closed and is 80 percent thicker than standard mesh material—for cleaner spring openings. SeaKlear PRS is the first EPA-approved clarifier system for trapping Cryptosporidium in pool and spa filters. SeaKlear PRS works to enhance filtration down to 0.5 micron, effectively trapping crypto, E. coli, Giardia and algae in the filter. This patented technology works by enhancing a filter's ability to remove particles that are too small to be trapped by the filter alone. SeaKlear PRS works with all pool filter media including sand, Zeolite, cellulose and cartridges. The product has received the WQA Gold Seal approval as well as the NSF 60 certification allowing recreational water facilities to use the product in Florida and other markets that require these standards.